Get Your Ears On – A Mickey and Minnie Celebration launches at the Disneyland Resort in January 2019, inviting guests to the biggest celebration of Mickey Mouse and Minnie Mouse in Disneyland history. Get Your Ears On will present new ways to celebrate Mickey and Minnie, with entertainment and decor at Disneyland Park, plus limited-time food and beverage offerings and festive event merchandise available throughout the resort. “Mickey’s Mix Magic”: Beginning Jan. 18, “Mickey’s Mix Magic,” will light up the night at Disneyland park with a new projection show, celebrating the one and only Mickey Mouse. This nightly extravaganza creates a family-fun dance party throughout the park, with “DJ” Mickey spinning the new celebration song, “It’s a Good Time” along with new, fun takes on favorite Disney songs. State-of-the-art projections, lighting and lasers will transform Main Street, U.S.A., the water screens of the Rivers of America and the façade of “it’s a small world” into a colorful, dazzling display of sights and sounds to celebrate Mickey Mouse. On select nights, “Mickey’s Mix Magic” will be enhanced with the addition of fireworks. “Mickey’s Soundsational Parade” returns to Disneyland park starting Jan. 25, with Mickey leading the way in a new larger-than-life opening, inspired by the classic and nostalgic Mickey pull toys. Chip ‘n’ Dale arrive with a giant celebration cake, as Mickey and his drum corps kick off a whimsical, musical procession of Disney characters. Valentine’s Month: From Jan. 22-Feb. 18, Disneyland Resort will celebrate the love of Minnie and Mickey for Valentine’s month. As guests enter Disneyland park, they will find a new Mickey Mouse flower “portrait,” and Valentine’s decor all along Main Street, U.S.A. and at Small World Mall. During Valentine’s month, guests may also choose to partake in Minnie’s Valentine Surprise, a special scavenger hunt experience in Disneyland park. Once guests have purchased a commemorative map and stickers at select merchandise locations, they may search for the hidden valentines that Minnie has left for Mickey around the park. Upon completion, they return their map to a designated location to redeem a special Valentine’s surprise. Food, beverage, merchandise and more: For a limited-time during Get Your Ears On, specialty food, beverage, novelty items and merchandise will be available for guests. Throughout the Disneyland Resort, guests will find “classic” Mickey- and Minnie-shaped foods, exclusive Get Your Ears On themed treats, holiday specialty items for Valentine’s month, and much more. Additionally, a celebration sipper and new Mickey Mouse and Minnie Mouse popcorn buckets will make their debut. Plus, new merchandise will be available for all ages, including celebration apparel, pins, plush, and Mickey and Minnie ears. In the Downtown Disney District, PANDORA will debut a limited-edition Disney dangle charm with a 14 karat gold “90,” Dooney & Bourke will feature new Mickey Mouse bags and a special Mickey Through the Years dress will be available at The Disney Dress Shop. 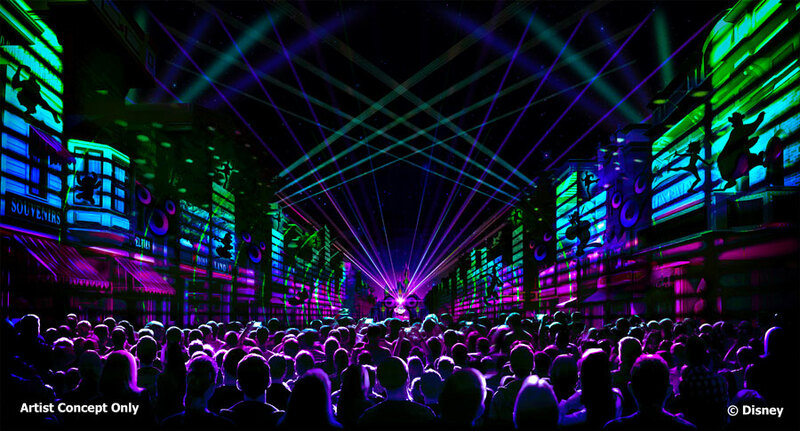 Are you ready to Get Your Ears On at Disneyland? Why not drop us a note to let us know how YOU to plan to celebrate Mickey and Minnie next year?